A lovely sunny day at Chester. The lawns were dry and proved challenging for all the players as the gradients and slopes had to be judged for every hoop approach. Fylde made a good start with Alan and Cath beating Maureen and Win 7-3. Maureen hit the first long hoop of the day with a 21 yard shot to win hoop 3. However, Philip and Catherine lost 5-4 in another timed out game as Fylde were about to win the equalising hoop .Alan and Philip lost to Maureen and Jayne 6-4 but there was an offside decision to be made when Alan promoted Philip’s ball at hoop 9 but then his ball ran over the halfway point to hoop 10. At the time of running the hoop, Alan’s ball was not in an offside position but the laws revealed that the offside is judged when the ball came to rest. Another law decision was required in the match when Alan and Catherine beat Maureen and Rosemary 5-4. Alan was placed to run hoop 9. Catherine hit Blue away but her Red ball struck Rosemary’s mallet. A non striking fault meant that Maureen had to miss her turn with Black, leaving Alan to run the hoop. At the end of all this “drama“, Chester led 4-2 at lunch. During lunch Philip was trained to operate the Chester microwave where he successfully heated the custard for the very large apple pie. He is not just good at digging trenches. The lawns were becoming drier and the Chester players were also struggling to come to terms with the playing conditions. Catherine had no such problem and had an excellent afternoon session. This round was won by Chester 3-1 Catherine beat Win 7-4. Chester again took this round 3-1 and the match. Catherine again was on form beating Maureen 7-4. Chester again won 3-1. Catherine completed a great performance by winning her last singles match. Cath lost in a tie break 6-7 and Philip was timed out losing 5-6. Alan lost the will to live and lost 3-6 to Maureen. Catherine gets another Mars Bar. Our Golf player of the season is Catherine Bass with 12 wins from 16 games. A rain forecast and the water level in the hoop holes made Alan consider whether to switch the singles to the morning session. However, after discussion with Geoff it was decided to start with the Doubles. Fylde made a good start by winning the first two doubles. Peter and Ian beat Geoff and Karen 7-3. Peter scored two 21 yard hoops and won the game with a jump shot at Hoop 10. Alan and Betty had a close match with Maureen and Jan but the home pair won the golden hoop 7-6. Honours were even for the next 4 doubles do Fylde led 4-2 at lunch. We had a welcome visit from Liz. This round was drawn 2-2. With wins for Peter and Alan over Maureen and Karen. Alan scored his second 21 yard hoop of the day and won the game with a jump shot. Betty lost at the golden hoop to Geoff. This round was also drawn. Jan was playing well and beat Beety 7-6 despite Betty running Hoop2 from 20 yards and later on producing a winning jump shot over two balls blocking her approach to the hoop. So with two rounds to go, Fylde were still in front. Pendle and Craven fought back in to the game by winning this round 3-1 to level the score. Beety was the only winner beating Karen 7-4. Fylde needed three wins from this final round to win the match. Betty beat Maureen 7-3 but Peter lost to Geoff 6-4 leaving Ian and Alan to complete the win. Ian had a real tussle with Karen who had used 3 bisques to tie the game at 6-6. Her first ball to hoop 13 was well positioned and with a bisque put the ball in front of the hoop. Ian followed coaching advice and fired at the back of the hoop and with a great shot from hoop 12 ran the hoop from reverse and finished in front Karen’s ball. Karen attempted a jump shot but only succeeded in knocking Ian’s ball through the hoop to secure a win for Ian 7-6. A point was now a certainty and it remained for Alan to beat Jan to win the match. Alan struggled to defend against 5 bisques and Jan overcame him to win 7-3. Honours even and Fylde stay third in the league with 5 points. Mars bars to Betty, Ian and Alan. Non playing captain Alan reports. FYLDE: Peter H, Catherine, Philip & Cath. Heavy rain whilst setting up the lawns made Alan consider whether to switch the singles to the morning session. However, Philip was able to advise that the water level was not going to be a problem and he was proven right as it stopped raining as the Southport team arrived. 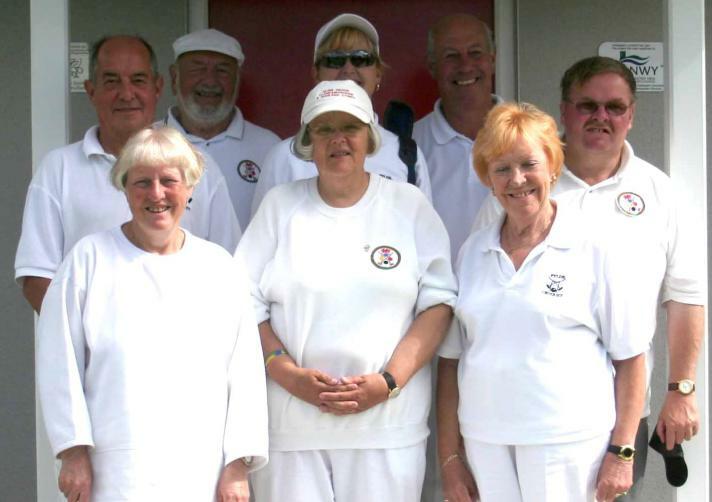 Fylde never really got going in the doubles as the only win was Peter and Catherine beating Bob and Mary 7-6. Four other games had single point wins but they all went to Southport. Michael in his match with Jean hit through hoop 3 to also run hoop 4. At lunch, Fylde were 5-1 down. Meanwhile, Alan in the pavilion had carefully set out the lunch when a wasp invaded the pavilion. The food was quickly covered and then using a Club sweatshirt the wasp was stunned when struck by the crossed mallets on the badge. The wasp landed on the welcome mat and was ejected but still alive. Liz and Ian made a welcome visit to see how we were going on and to assess the new project of a sun/rain shelter. This round was drawn 2-2. With wins for Peter and Catherine over Jean and Michael. Cath lost at the golden hoop to Mary. Southport took this round 3-1. In Philip’s game with Mary, he ran 3 hoops with jump shots but still lost the game 6-7. Also in this match the timer went missing and as the players didn’t know what time they had started, they agreed to play to 7 points without a time limit. The match score now stood at 4-10 to Southport. Alan suggested to the Fylde team that if they won the remaining eight games they would win the match. Catherine beat Bob 7-6 enabled by a perfectly placed shot from Hoop 12 to Hoop 13. Philip Beat Michael 5-4 and Cath beat Jean 7-5. Peter unfortunately lost 4-7 to Mary. This round was drawn 2-2. With Fylde winning two more Golden Hoop games with wins from Peter and Catherine. Fylde fought well in the Singles finishing 8-8 but the poor result in the Doubles caused the defeat. Out of 22 matches, 11 were won by a single hoop. (7 golden hoops). Fylde arrived at Llanfairfechan at 0930 in sunny conditions with views of Puffin Island, Anglesey and the shimmering blue water of the Menai Straits. We were warmly welcomed by our hosts in their new clubhouse. Betty asked why there was no flag flying and it seemed it had been overlooked but soon the Welsh dragon was fluttering in the light breeze. Conditions were perfect on two different sized lawns that were running medium quick. Betty and Ian got Fylde off to a winning start by beating Cecilia and Graham 7-5 hilst Alan and Cath lost by the same score to Anwen and Frank. The next two matches were also a shared win for both Clubs. Cath ran the first long hoop of the day with an 11 yard shot at hoop 6 in her game with Betty. The morning session was completed with Fylde winning the last two doubles. Alan and Betty beat Anwen and Cecilia 7-5 with some good hoop running . Alan won hoop 5 with a shot from the boundary and Anwen hit a 21 yard shot to win hoop 8. Cecilia made hoop 10 from 10yards. Meanwhile Cath and Ian won a ‘golden hoop’ decider 7-6. So at lunch Fylde were in the lead by 4-2. Llanfairfechan took this round by 3 games to 1. Betty was the only winner with a 7-6 win. over Frank. Fylde fought back and took this round by 3 games to 1 to take the overall lead 8-6. In this round the match wins were shared. Betty continued her fine form by beating Anwen 7-5 which included an angled shot to hoop 2 from 15 yards. The match now stood at 10-8 to Fylde . With 2 wins needed for victory, they were unstoppable ,winning all four games. Alan played his best croquet of the day with a 7-1 win over Anwen He ran hoop 2 from 21 yards and then took hoop 3 with a jump shot which put him 3-0 up ,a deficit that Anwen could not close. Betty beat Cecilia 7-5, Ian and Cath both had determined ‘golden hoop’ wins 7-6 to crown a fine team performance with a 14-8 win. Conditions were overcast but pleasant. Mac had been persuaded by Susan to play Golf but at Handicap 4 we knew he would be in for a hard day. However, he and the Bury team enjoyed the day at Fylde. Fylde made a good start by winning the first two doubles. Alan and Cath beat Mac and Mick 7-6 whilst Philip and Catherine beat Susan and Maureen 7-5. The remaining four doubles were won by Bury 7-5,7-6,7-6 ,7-5. Fylde were 2-4 down at lunch but had given a good account of themselves . Liz, Ian and Martin made a welcome visit to see how we were going on. Fylde took this round by 3 games to 1. Alan beat Maureen 7-5 in a close game which saw Maureen win hoop 10 with a 21 yard shot. Catherine had a comfortable 7-3 win over Mick and Philip beat Mac 6-4. Fylde again took this round by 3 games to 1to take the overall lead in the match. Alan had to come from behind to win the last four hoops to beat Mick 7-5. Catherine beat Maureen 7-4 and Cath had a good win against Mac7-5. This round was drawn 2-2. Alan beat Mac 7-5, Philip beat Maureen 7-3. The overall match score of 14-8 gave Fylde their first win of the season. All the players made a contribution to the win .Alan won all his four singles triggering handicap 7 and Mars Bars are awarded to Catherine and Philip for both having three singles and a doubles win. Cath has the Captain’s Mars Bar for 2 singles and a doubles win. 7 teams competed over the two-day Golf event. On each day, the humid morning conditions gave way to heavy rain and a return to sun in the afternoon. Having mastered the North Lawns on Saturday (much better condition than 2008) the teams moved to the smooth, faster South Lawns on Day 2. This enabled better continuity of play. Fylde managed 8 wins on Day 1 with all credit to Catherine Morton and Philip Bass with three resounding wins each. Catherine Bass managed 2 wins but failed to secure a further 2 at the Golden Hoop. On Sunday, teams were told to ignore the order of play and lawn numbers, so Fylde were in play earlier than might have been expected! Our star player was Abdul Ahmad who beat all comers 6-4, 7-4, 7-2, 7-2, 7-2. A lady from Southport, who stepped in for Fylde for a first game, fought valiantly but couldn’t just manage to score the Golden Hoop. It emerged later in the afternoon that Abdul’s car had suffered a clutch problem close to the venue and he had willed it to arrive at the final destination! However, he said nothing about it and waited until all his matches were completed in the afternoon before calling the AA for help to get him and the car home – what a professional and great team player! Philip and Catherine won 6 matches on day 2, narrowly missing out on a further 3 matches by 1 point. All Golf players showed commitment and determination to win, pipped only by teams from Southport and Llanfairfechan. I believe the Golf team contributed to Fylde’s success in coming 4th overall in the Jamboree (out of 8 competing teams) with 12 points. The winners were Bowden, who drew on 14 points with Southport (beating them on number of games won overall). The score line does not accurately reflect the effort and determination of the Fylde team in a contest against the unpredictable crown green lawns as much as against the low handicapped experts at Bury. On a lovely sunny day and with the undulating lawns swathed in the snow-like fluffy seed pods from a nearby tree, there was no time for a quick recce or practice as Bury were keen to get the match started by 9.45am. Warming up in the early rounds, Fylde managed only 2 wins out of the 6 doubles games, three of which went to full time an indication of Fylde's determination to fight every battle. Fylde secured 6 of the singles matches and narrowly missed out on a further 4 by just 1 point, 3 of these at the Golden Hoop. During an early match, Marilyn took aim to rush her opponent’s ball away from the front of the hoop. A little too much pressure down on the ball created a perfect jump shot through the hoop. In other circumstances, this would have been a cause for celebration - but Marilyn had taken a bisque – and so no point was scored in this Golf game! In his first singles game of the afternoon, Ian watched his opponent run hoop 3. Taking care to watch the lay of the land and judge his distance carefully, Ian aimed his stroke towards hoop 4 and ran it in one stroke – from its original resting place beside hoop 3! In a gripping finish and at 6-4 down Philip, scored hoop 11 with Black which continued on its journey to lodge in the jaws of hoop 12. His opponent played her balls to spots on the on-side of halfway to the Golden Hoop with the added advantage of being first to arrive at hoop 13 when Black completed its hoop 12 run. The score finished 7-6 to Bury. Marilyn, in her first match of the season and only her second career match, fought back in her last singles game to win 5-7 and end the day on a high note. Well done! Of the last 8 games, Fylde won 4 and took 2 others to Golden Hoop, but had found their feet just too late to save the day. After meeting at Bamber Bridge, there was some reminiscing about our first match at Culcheth in 2005. Three of the team that day were playing in this match and we recalled the heavy 2-14 defeat of 4 years ago . We were determined to put up a good performance . The conditions were blustery with a cool wind. Alan was expecting to open for Fylde but had not noticed that the teamsheet format had changed and so it fell to Ian to get the Golf season underway . He did very well by beating the experienced Bob 7-6. Alan was looking at going behind 1-3 to Eric when he had the opportunity to put Liz’s jump shot coaching into practice with Eric’s red ball nestled in hoop 4. A perfect jump shot made it all square and Alan went onto win 7-3. Betty had a close game with Shirley, who won the game 7-6. Cath lost 4-7 to Anne. This round finished 2-2 with Betty beating Bob 7-4 and Cath beating Eric 7-4.